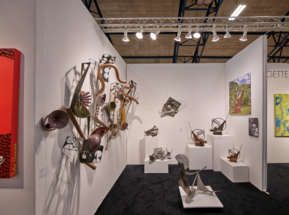 Dina Wind (1938-2014) receives Outstanding Philadelphia Artist Award on the opening night of the Philadelphia Fine Art Fair on Thursday, April 4, 2019. Philadelphia, PA – Bridgette Mayer Gallery is pleased to announce gallery artist Dina Wind’s (1938-2014) Outstanding Philadelphia Artist Award presented by the Philadelphia Fine Art Fair in its inaugural event. Wind was honored with the award for her for a lifetime commitment to her own artistic practice, and to the Philadelphia community. 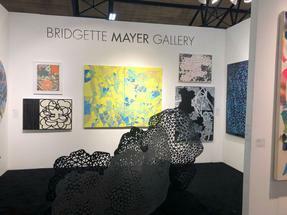 Thursday, March 28, 6 p.m.
Bridgette Mayer Gallery announces its participation in the Philadelphia Fine Art Fair, the city’s first world class fine art fair where international, contemporary, and modern art collectors, curators and art lovers gather to acquire new works and exchange cultural ideas. 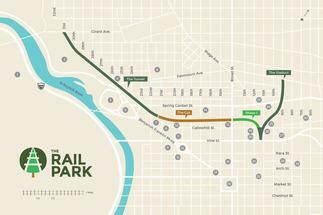 The Bridgette Mayer Gallery in partnership with Arts+ Crafts Holdings will unveil and present a check to the Friends of the Rail Park from the proceeds raised from the 2018 Benefit Exhibition. This event will occur on Friday, December 14th from 4:00 – 5:00pm at the Rail Park at 1300 Noble Street. Free and open to the public, attendees can enter via Noble St. (by car or foot) at Broad & Noble or 12th & Noble or via the stairs between 12th and 13th on Callowhill. Hot chocolate and hot toddies will be provided for this celebratory occasion as well. The Bridgette Mayer Gallery is delighted to announce gallery artist Rebecca Rutstein’s distinguished award as the Delta Visiting Chair for Global Understanding from the University of Georgia as well as her upcoming solo exhibition, Out of the Darkness: Light in the depths of the Sea of Cortez at the Georgia Museum of Art. Interview with Sarah McEneaney who founded the first nonprofit group (along with John Struble), the Reading Viaduct Project, to advocate for turning the Reading Viaduct into a public park. Today we’d like to introduce you to Dana Hargrove. While completing my BFA in Scotland, I was recruited, along with several other students, to attend Southern Illinois University. It was funny to travel 4000 miles across the Atlantic, to a small university town in the middle of Illinois, to complete an MFA alongside so many Scottish artists! My decision to uproot was a difficult one, but it ultimately paid off. Grad-school became one of the best experiences of my life and fostered much-needed courage and confidence within my art and myself. After returning home to Scotland post-graduation, I ended up making the final decision to emigrate to the USA. I subsequently became a professor of studio art and have been teaching and making art, with a base in Orlando, Florida, ever since. 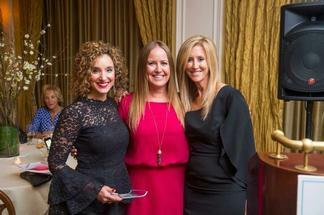 On October 18th Bridgette Mayer was honored by the NY & Philadelphia non-profit Helpusadopt.org with a Voice of Adoption Award at Overbrook Golf Club in Villanova. Founder, Becky Fawcett stated, "Bridgette's story, as detailed in The Art Cure, is devastatingly sad, but also beautiful, demonstrating her heroism and great strength. She uses her story to spread awareness about adoption, and to shed light on the difficulties faced by children waiting for a permanent home. It is because of this strength, and her commitment to help children who need to be adopted that we awarded Bridgette with The Helpusadopt.org 2017 Voice of Adoption Award. Nearly 200 guests attended Helpusadopt.org's Family Building Benefit on Wednesday, October 18th to celebrate the organization's 10th Anniversary. The evening began with a VIP Founder's Reception for 50 sponsors at which Bridgette spoke about her impressive career as a gallery owner and art consultant." Bridgette Mayer sits down with Natalie Hope McDonald of the Philly Voice to discuss forthcoming book: "The Art Cure: A memoir of abuse and fortune." 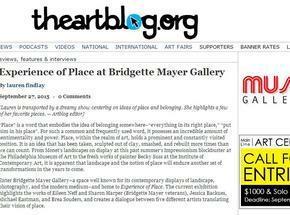 Bridgette Mayer Gallery's recent announcement of going private was featured by Philadelphia's artblog. Please join Bridgette Mayer on Thursday, June 16th for an intimate evening with other artists and creative types. She will be pre-launching her book: The Art Cure: A Memoir of Abuse & Fortune and giving a book talk and workshop about taking your career to the next level in 2016-2017. 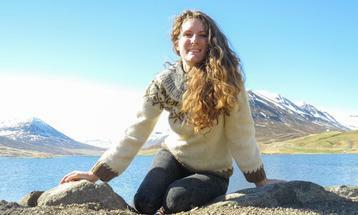 Following the success of her trip aboard the Nautilus exploration vessel in July 2015, Philadelphia artist Rebecca Rutstein has been selected to travel aboard research vessel Falkor for her second “Artist-at-Sea” residency in June 2016. Anna Gibertini writes about "The Things We Carry," a special group exhibition at the Gibbes Museum of Art which features the work of gallery artist Damian Stamer. Bridgette Mayer Gallery announces Dana Hargrove’s participation in: Window (re/production | re/presentation) "a thing re | sembling a win • dow" May 20th – June 25th, 2016. Paul Oberst is one of the 25 artists to be selected for the 2016 Biennial exhibition at the Center for Maine Contemporary Art in Rockland, Maine. Gallery artist Damian Stamer is exhibiting in two museum exhibitions this summer: "Altered Land: Works by Damian Stamer and Greg Lindquist" at the North Carolina Museum of Art and "The Things We Carry: Contemporary Art in the South" at the Gibbes Museum of Art. 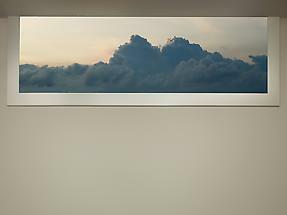 BMG "Nature Decor" PHOTO CONTEST April 2016! 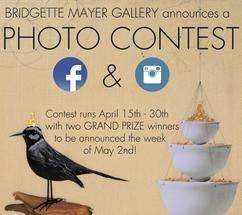 Bridgette Mayer Gallery is hosting a photo contest via Facebook and Instagram in conjunction with our current solo exhibition "Nature Decor" by Kaoru Mansour! Bridgette Mayer Gallery is pleased to announce that on April 5, 2016, the Board of Trustees of the John Simon Guggenheim Memorial Foundation approved the awarding of a Guggenheim Fellowship to gallery artist Eileen Neff. The gallery is pleased to announce that Sharon Harper is speaking at the Penumbra Foundation on Tuesday, April 5th at 7pm. Several works by Paul Oberst are to be included in a group exhibition at the UMVA Gallery at CTN in Portland, Maine. Curated by Jeffrey Ackerman and Veronica Cross, "Neurotica," will be on view from April 1 - 30 with an opening reception on Friday, April 1 from 5-8 pm. 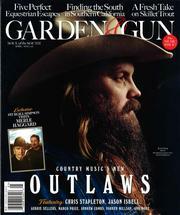 Damian Stamer was recently featured in Garden & Gun Magazine. 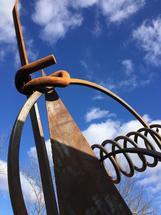 The Woodmere Art Museum will be unveiling a new Dina Wind sculpture on their grounds this June. In conjunction with this event and the accompanying exhibition at the museum, the gallery will also be presenting a selection of the artist's sculptures in a special presentation in the Vault Project Space entitled "Springs!" from May 3 - June 24, 2016. The gallery is pleased to announce that Sharon Harper is currently featured in a group exhibition at William Patterson University in New Jersey. 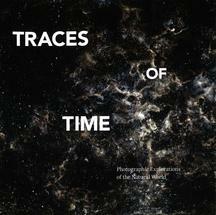 "Traces of Time: Photographic Explorations of the Natural World" is on view from Jan 25th - Mar 24th, 2016. 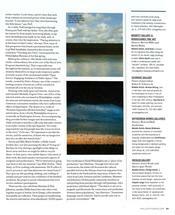 Where Magazine includes Kaoru Mansour's upcoming solo exhibition "Nature Decor" in their Gallery and Antiques guide for March. Bridgette Mayer interviews Philadelphia sculptor Michael Stifel in anticipation of his installation in the Vault Project Space, Feb. 2 - 27, 2016. 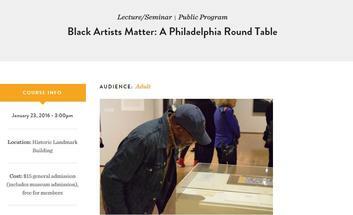 In conjunction with Procession: The Art of Norman Lewis, this program will highlight – and perhaps complicate – the reality of being a black artist in Philadelphia in the 1960s and 1970s. What were the challenges? What were the unique opportunities? 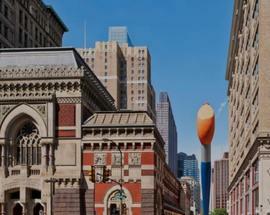 How is the Philadelphia art world of today different – or not – from those realities? Panelists will use their own lives and careers to address these issues and make connections to the larger urban art world context in which Norman Lewis worked. Panelists include Moe Brooker, Martha Jackson Jarvis and Charles Burwell, in conversation with A.M. Weaver. In anticipation of his first solo show with the gallery, owner and founder Bridgette Mayer interviews North Carolina based artist Damian Stamer about his process and the inspiration behind his paintings. Point & Counterpoint, the North Carolina Arts Council Artist Fellowship Exhibition, features the work of 18 vibrant artists working in diverse mediums from visual arts to choreography. 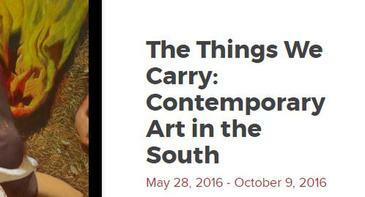 The exhibition runs through January 17, 2016 at the Southeastern Center for Contemporary Art (SECCA) in Winston-Salem. The artists participating in the show include 10 visual artists, four craft artists, two film/video artists, and two choreographers — all were recipients of the 2014-15 Artist Fellowship awards. Marvin Aguilar of Artblog reviews Nathan Pankratz' solo exhibition "So many ways to say I love you, I think I'll try every one." Artblog writes a feature article on gallery artist Rebecca Rutstein's major accomplishments in 2015. 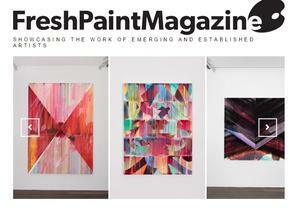 Nathan Pankratz is interviewed by Fresh Paint Magazine for their 10th Issue published in December 2015. 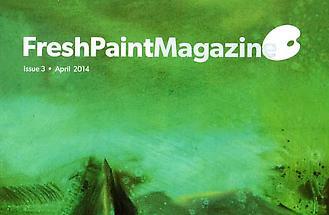 Where Magazine features Nathan Pankratz' latest solo exhibition at Bridgette Mayer Gallery. 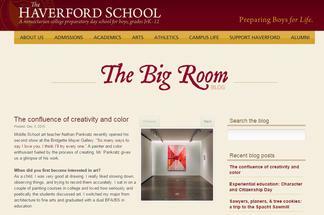 Nathan Pankratz is interviewed by the Big Room Blog which is published by Haverford School. Gallery artist Charles Burwell was included in the exhibition "Faculty Selects" at the Grossman Gallery at Lafayette College in Easton, PA. 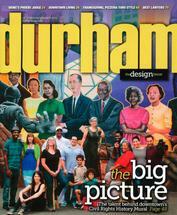 The exhibition runs from Nov. 6 - Dec. 19 with an opening reception on Nov. 5 at 4:30. 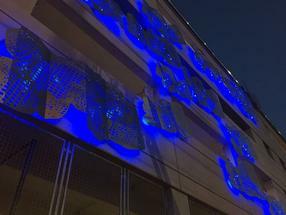 Bridgette Mayer Art Advisors is pleased to announce the completion of a 1% Art Project at Temple University’s LEED Certified parking garage on the corner of 11th and Montgomery Streets. Bridgette Mayer Gallery hosted a special evening featuring a book signing and talk with Bucknell University Samek Art Museum Director, Richard Rinehart as well as artists Ken Goldberg and Stephen Antonson. 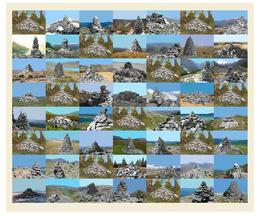 Lauren Findlay reviews "Experience of Place" for the artblog. 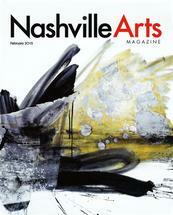 Damain Stamer's exhibiiton "Visual Spaces" was reviewed in Nashville Arts Magazine. 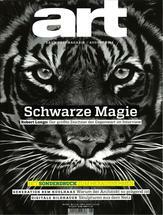 Damian Stamer was interviewed for a German arts magazine. 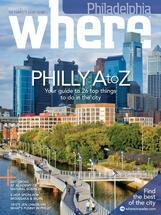 The gallery is featured in the Galleries + Antiques guide section of the August issue of Where Philadelphia Magazine. 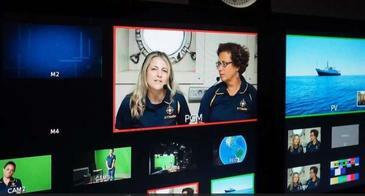 Rebecca Rustein was selected as an "Artist At Sea" Science Communication Fellow where she was given the opportunity to travel aboard the Nautilus exploration vessel. Working alongside a team of scientists, she used their data mapping the ocean floor to create a new series of paintings. Rebecca Rutstein will share her experiences aboard the Nautilus as an "Artist at Sea" with students of PAFA's "Sculpture on the Edge" summer camp. 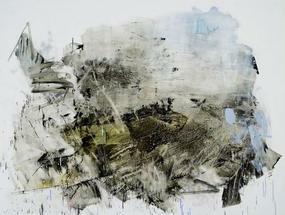 Peter Crimmins interviews gallery artist Rebecca Rutstein for Newsworks.org. 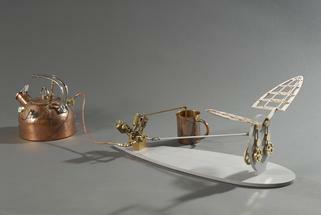 Gallery Artist Rebecca Rutstein sets sail aboard the Nautilus exploration vessel as an "Artist at Sea." 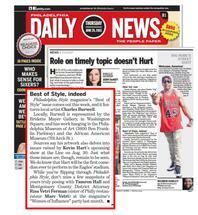 Charles Burwell's recent feature in Philadelphia Style Magazine was mentioned in the Philadelphia Daily News. 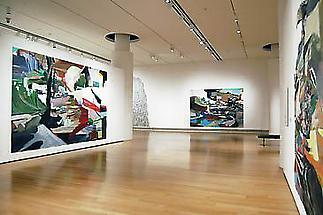 Bridgette Mayer Gallery named one of 8 Philadelphia galleries propelling the city onto the international arts stage. An image of Rebecca Rutstein's "Sky Terrain" installation was featured in the article and both Rutstein and Dana Hargrove were mentioned as notable artists represented by the gallery. 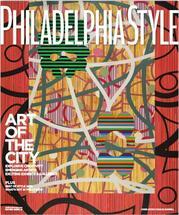 Gallery artist Charles Burwell is featured on the cover of the latest issue of Philadelphia Style Magazine. 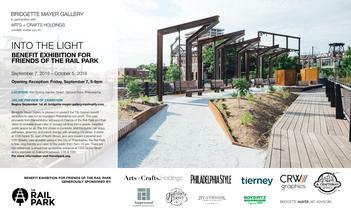 In his very own four page spread, Burwell explains how Philadelphia is one the greatest inspirations for his work. 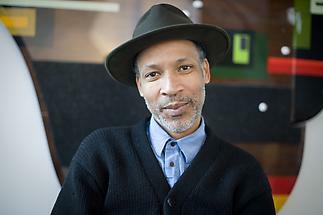 He states: "there's certainly a connection to my living and working in Philadelphia with all of its visual complexity". 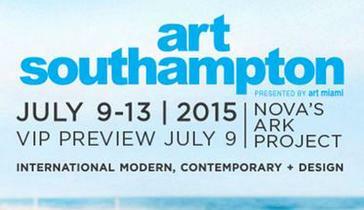 Bridgette Mayer Gallery will participate in the 2015 Art Southampton Fair, which opens with a VIP private preview benefiting the Parrish Art Museum on Thursday July 9th and runs through July 13th, 2015. Located in the Hamptons, the five- day fair will feature a carefully selected group of 80 international art galleries exhibiting paintings, sculpture, works on paper, photography, video and installation by modern and contemporary artists. The gallery will feature works from a number of artists in their primary program including Federico Herrero, Rebecca Rutstein, Charles Burwell, Sharon Harpe, Neil Anderson, Eileen Neff, Stuart Netsky, and Ryan McGinness. 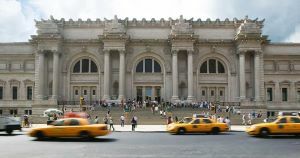 In addition, works by prominent artists such as Donald Judd, Graeme Todd, Douglas Gordon, Jin Meyerson, Wentworth, and Red Grooms will also be exhibited. We are excited to announce that in addition to the works on display in our booth, we have been invited to present several outdoor sculptures on the fair’s grounds. We will exhibit two large-scale aluminum sculptures by Dina Wind and a site-specific banded pole installation by Paul Oberst. Alexander Fiorentino reviews Rebecca Rutstein's solo exhibition "Afterglow" on view at Bridgette Mayer Gallery from April 22 - May 30, 2015. Gallery Artist Charles Burwell is exhibiting in two coinciding shows: Layering Constructs at the Delaware Art Museum on view from April 11 - August 2, 2015 and Layering Constructs at the Delaware Center for the Contemporary Arts on view from April 18 - September 7, 2015. 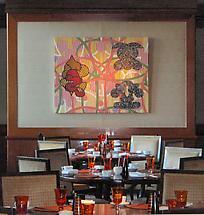 The painting pictured is the longest Burwell has every created, measuring 21 feet long. 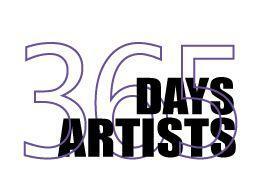 An interview with gallery artist Tim McFarlane was featured on 365 Artists 365 Days. 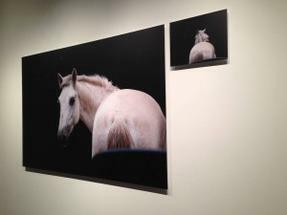 The LaNapoule Art Foundation featured an interview with Eileen Neff on their blog. 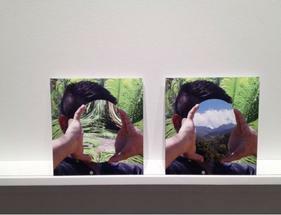 Colin Pezzano's first solo exhibition "Contain You" was featured on Art Daily. His exhibition is on view at Bridgette Mayer Gallery from April 29 - May 30, 2015. 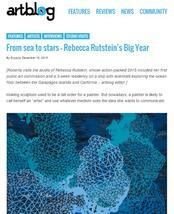 Rebecca Rutstein, represented by the Bridgette Mayer Gallery, has been selected as a 2015 “Artist at Sea” Science Communication Fellow and will sail aboard Exploration Vessel (E/V) Nautilus during its 2015 expedition. 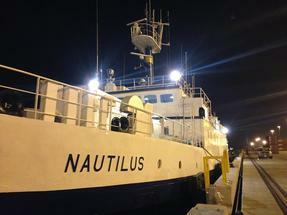 Rutstein will join the Corps of Exploration aboard E/V Nautilus in July as they explore from the Galápagos Islands to the southern California coast, focusing on an area 1000 nm west of Colima, Mexico to international waters, where there are two sites of interest for seafloor mapping. 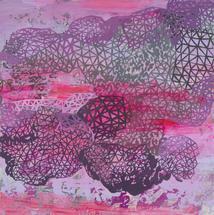 Dana Hargrove exhibiting in "Women and Abstraction"
Dana Hargrove will be exhibition work in "Women and Abstraction" at the Cornell Fine Arts Museum at Rollins College. "Women and Abstraction" examines the fundamental ways in which women artists working in the United STates have engaged with abstraction. Irena Frumkin reviews Eileen Neff's solo exhibition "Traveling into View" on view at Bridgette Mayer Gallery from March 4 - April 18, 2015. Eileen Neff and Shelly Spector named two of "10 Philadelphia Female Artists You Need to Know"
Eileen Neff and Shelley Spector were included in The Philly Voice's list of !0 Philadelphia Female Artists You Need to Know, written by Natalie McDonald. 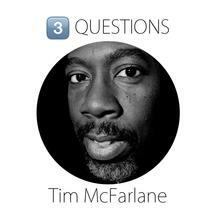 Gallery artist Tim McFarlane was interviewed on Your Daily Bread on Ello. Roberta Fallon from Artblog interviewed Bridgette Mayer about Eileen Neff's solo exhibition "Traveling into View" on display at the gallery from March 4 - April 18, 2015. Angela Gervasi from The Temple News interviewed gallery artist Eileen Neff about her new body of work based on a residency in Costa Rica. An article by Peter Crimmins on Shelley Spector's exhibition "Keep The Home Fires Burning" at the Philadelphia Museum of Art. Diane Loercher Pazicky wrote a brief review of Dina Wind's work, on view from February 4-28 at Bridgette Mayer Gallery, for the Philadelphia artblog. 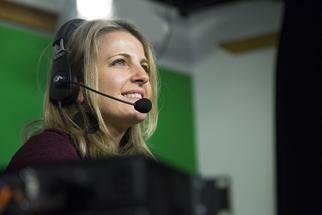 as a segment at 8:30 p.m. on WHYY-TV. Gallery Artists Rebecca Rutstein, Tim McFarlane and Charles Burwell will be featured in an upcoming exhibition at the Philip Slein Gallery in St. Louis. 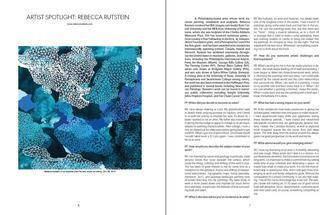 Gallery Artist Rebecca Rutstein was interviewed by Fresh Paint Magazine and featured as a Spotlight Artist in their 6th issue. 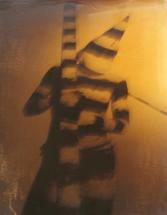 Michael Carroll reviews Stuart Netsky's solo exhibition "Sirens" for Geist-Magazine. Edith Newhall reviews Stuart Netsky's solo exhibition "Sirens" on view at Bridgette Mayer Gallery from December 2, 2014 - January 30, 2015 for the Philadelphia Inquirer. 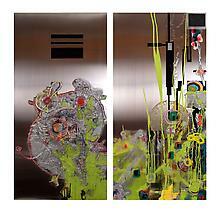 Jennifer Zarro reviews Stuart Netsky's solo exhibition "Sirens" for artblog. 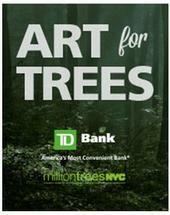 TD Bank, America’s Most Convenient Bank®, launched the “TD Forests: Art for Trees” campaign to support its vision of a greener New York City. 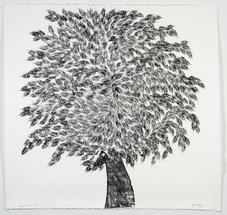 To bring this project to life, TD Bank, along with art curator and gallery owner Bridgette Mayer of Bridgette Mayer Gallery, selected 10 artists who are passionate about the environment to create original pieces of art which are available for purchase through November 14 via an online auction at paddle8.com/auctions/artfortrees. All proceeds from the auction will be equally distributed among the New York Restoration Project, Friends of the High Line, Brooklyn Botanic Garden and Trees New York. Bridgette Mayer Gallery is pleased to announce a new solo exhibition by gallery artist Dana Hargrove at Arts on Douglas in New Smyrna Beach, FL. 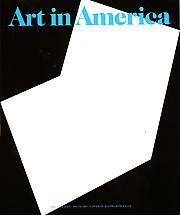 The exhibition will be on view November 1- December 13, 2014 with an opening reception on Saturday, November 1, from 4 -7pm. Dedication to creating a greener future means always searching for new ways of bringing the movement to life. That's why TD Bank decided to tap into the colorful communities they serve for a bit of inspiration. Curated by Bridgette Mayer, 10 artists artwork will be on view throughout the month of October in pop up galleries as well as reproduced on store fronts throughout New York City. Bridgette Mayer Gallery is excited to announce that gallery artists Eileen Neff and Shelley Spector will be featured in the upcoming exhibition "Begin Where You Are" held in the Icebox Project Space at the Crane Arts Building in Philadelphia. 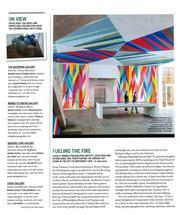 Edith Newhall reviewed "Young & Fun: Abstraction" for the Philadelphia Inquirer. BalletX will hold three performances at Bridgette Mayer Gallery as part of the Philadelphia Fringe Festival and in conjunction with the 2014 Benefit Exhibition. 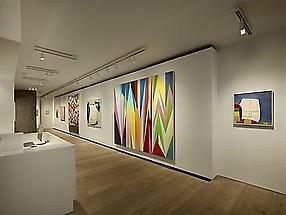 Our summer exhibition "Young & Fun: Abstraction" was reviewed by Lauren Findlay for artblog. 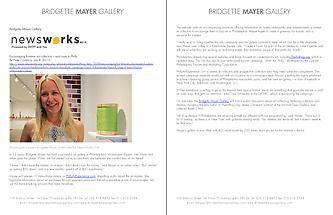 Bridgette Mayer Gallery was featured in the "Best of Style" section for Art and Home Decor. The gallery is also mentioned in the Invited section, where it is acknowledged as a sponsor in the write up of the Roche Bobois event in May. Both the Guggenheim Museum and the Saatchi Museum in London recently purchased paintings by gallery artist Federico Herrero. 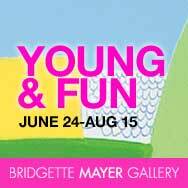 New works will also be featured in the gallery's upcoming exhibition "Young & Fun: Abstraction," which will be on view from June 24 - August 15, 2014. 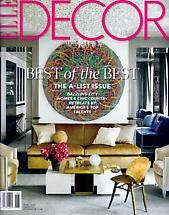 We are pleased to share that gallery artist Ryan McGinness was recently featured on the cover of Elle Decor Magazine with one of his "Black Hole Paintings." Three of his works are currently on display in the gallery in our show "Print//Line" and will be on view until June 21st, 2014. Artist Clara Fialho was just featured on Saatchi Art's website and was named by chief curator Rebecca Wilson as "One To Watch." 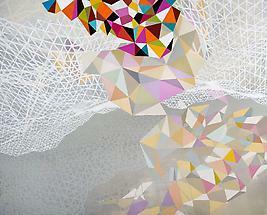 A few of her works will be included in our upcoming exhibition "Young and Fun: Abstraction." 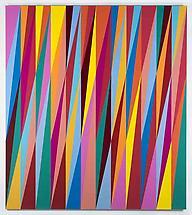 Hilarie M. Sheets profiles several African American artists, including gallery artist Odili Donald Odita in the article "Black Abstraction: Not a Contradiction." Odili Donald Odita is a Nigerian born, internationally known painter who is represented in New York by the Jack Shainman Gallery and was recently featured in Elle Decor Magazine. 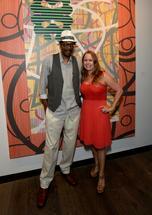 He will be showing in a solo exhibition at Bridgette Mayer Gallery in Fall 2014. 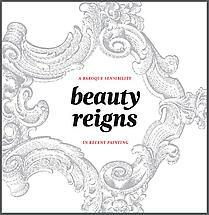 Bridgette Mayer Gallery is pleased to announce that two gallery artists, Ryan McGinness and Charles Burwell, will be exhibiting in the upcoming traveling exhibition, "Beauty Reigns: A Baroque Sensibility in Recent Painting." 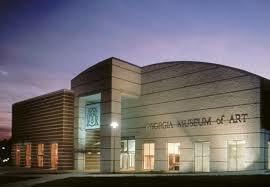 The show's first venue is the McNay Museum in San Antonio, Texas. Bridgette Mayer sat down with Matt Hughes of Bucknell Magazine to discuss her gallery's program and what it's like to have her job. Bridgette Mayer sat down with Ryan McManus for Fresh paint magazine to discuss her recent collaborations with artists like Ryan McGinness, her inspirations as a curator and art dealer, and being one of the Tory Burch Foundation's "Women to Watch"
Shelley Spector with be participating in the "FiberNext" group exhibition at the Delaware Art Museum. 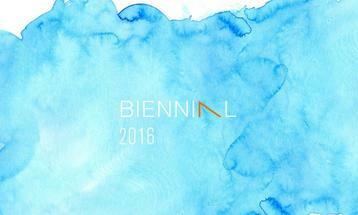 The Exhibition will be on view from February 15, 2014 – April 13, 2014. 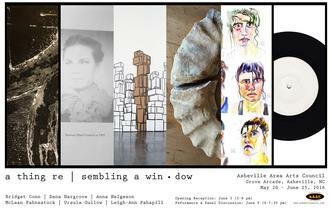 Opening reception, Sunday, February 16, 12-4 pm, with an rtist talk from 2-4 pm. 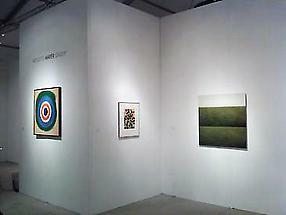 Art Miami stands out as one of the highlights of the fall art fair season. What sets it apart is its longstanding commitment to providing access to the best of the Contemporary art market, spanning both the 20th and 21st centuries. As the oldest art fair hosted in the Miami region, Art Miami doesn’t disappoint. Celebrating its 24th anniversary, it will run from December 3 through 8, and expects to welcome over 60,000 visitors. 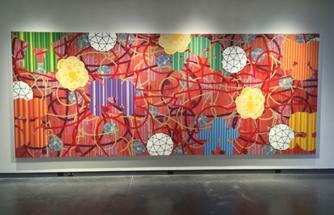 Bridgette Mayer’s newest solo show of Ryan McGinness works entitled Finding Infinity is fun, vibrant, and refreshing. A world class artist has decided to sell his wok in Philadelphia, and the community could not be happier. McGinness has quite the international reputation, with his work featured in such prestigious collections as the Museum of Modern Art’s and the Metropolitan Museum of Art’s. However, he is not a stranger to Pennsylvania. 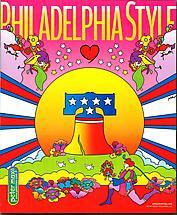 He interned in the curatorial department of the Andy Warhol Museum while in school at Carnegie Mellon. His choice to work there seems to be one that would influence his work for decades. 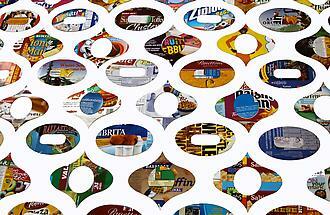 His abstract work is reminiscent of logos. 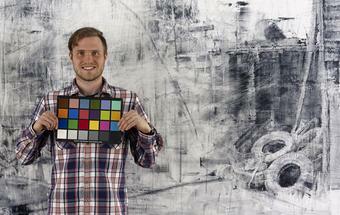 They are maximalist pieces with a distinct Warholian influence. McGinness’ most iconic works could be his own brand. 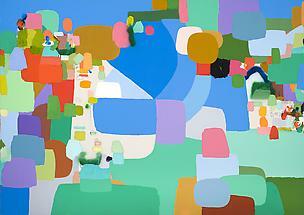 They are instantly recognizable as his, with bright shapes piled on top one another and resting on a solid background. Mural Arts Program, Bridgette Mayer Gallery, University City Science Center and Wexford Science & Technology: A Biomed Realty Company present Ryan McGinness’ Black Holes. World-renowned artist Ryan McGinness’ monumental Black Holes series is an exploration of how ideas of outer space and mind space can intertwine. The work features layers of “event horizons,” creating a feeling of portals into an infinite inner space, and a strong gravitational pull on the senses. The Bridgette Mayer Gallery and gallery artist German Gomez were featured in Philadelphia Gay News, in an overview of the Benefit Exhibition for Ballet X and its LGBT contributors. Kristina Jenkins discusses the Bridgette Mayer Gallery's Benefit Exhibition for Ballet X and the launching of Philly Art Experience. 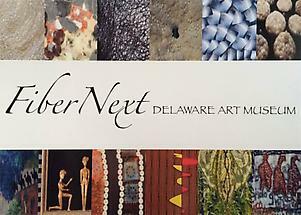 Bridgette Mayer was featured on NPR's "Newsworks" during a discussion about first-time art collecting, including PhillyArtExperience.com and its aim at collectors to encourage them to buy art in Philadelphia. 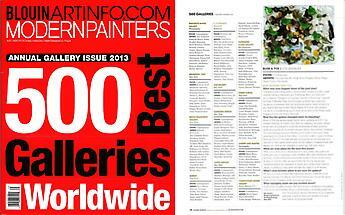 Modern Painters recognizes the Bridgette Mayer Gallery among the best contemporary galleries worldwide in its "500 Best Galleries Worldwide" annual issue. 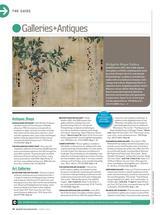 Edith Newhall reviews Radcliffe Bailey's April exhibition Notes from Tervuren in the June 2013 issue of ARTnews. In "Tease," Jan Rattia offers a rare window into the lives of those mysterious men who make their living disrobing for strangers. In its eighty-ninth annual competition for the United States and Canada, the John Simon Guggenheim Memorial Foundation has awarded Fellowships to a diverse group of 175 scholars, artists, and scientists. 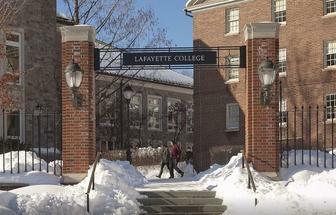 Appointed on the basis of prior achievement and exceptional promise, the successful candidates were chosen from a group of almost 3,000 applicants. 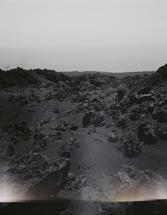 Sharon Harper is one of eleven Fellows selected for Photography. 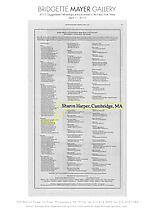 Ms. Sharon Harper, Photographer, Cambridge, Massachusetts, and Associate Professor of Visual and Environmental Studies, Harvard University: Photography. 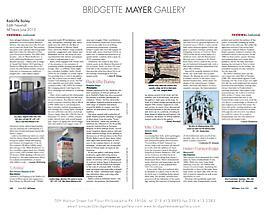 Gallery Director and Owner Bridgette Mayer is featured in the April/May issue of Society Magazine, both as Guest Editor and in an interview with Christian S. Dougherty, President. Bridgette Mayer, and gallery artist Shelley Spector were featured on NPR's "Newsworks" during a discussion about collecting art, particularly in Philadelphia. 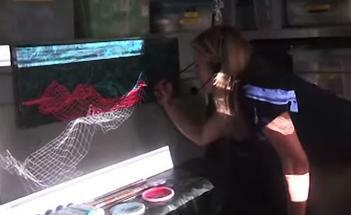 Bridgette Mayer is interviewed on running a gallery during a recession. Director, Bridgette Mayer was interviewed by Farrel Levenson- a student at the University of Pennsylvania who is currently taking an art and economics course. Studying the effects of the recession on the art market and other pertinent topics in the art industry, Farrel asked some interesting questions that pertain to the past several years of Mayer’s business. 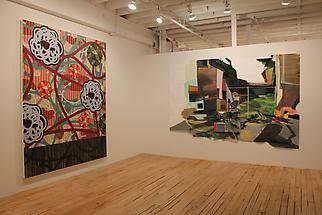 Read on for an insightful look into gallery practices, pre, during and post-recession. 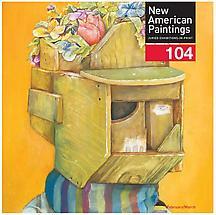 Gallery artists, Arden Bendler Browning and Nathan Pankratz were selected for the Northeast issue of New American Paintings, #104. 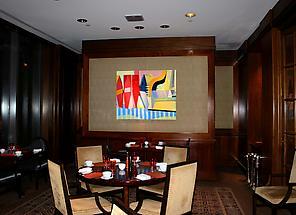 Paintings by Mark Brosseau will be featured at the Fountain Restaurant at the Four Seasons Hotel from February through March 2013. 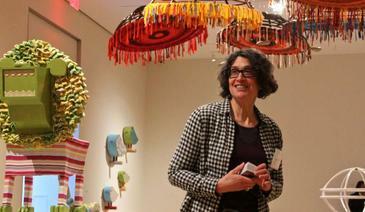 Shelley Spector received an Art and Change Grant from the Leeway Foundation as well as a Faculty Development Grant from the Pennsylvania Academy of the Fine Arts for her installation "Mariposa". 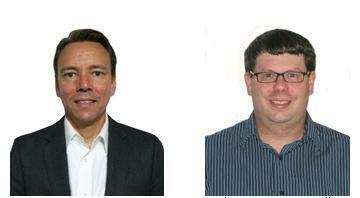 Bridgette Mayer Gallery is pleased to announce the appointment of new Assistant Directors Daniel Weiner and Mark Brosseau. 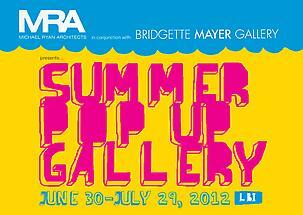 For the second year in a row, Michael Ryan Architects in conjunction with Bridgette Mayer Gallery, are hosting a Pop-Up Gallery at their space in Loveladies, Long Beach Island, NJ. 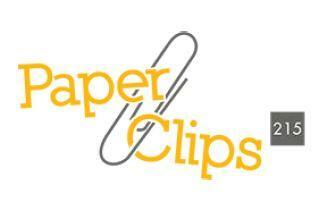 Click on the PDF to read an article about the show as published in The Sandpaper. We are thrilled to announce that Bridgette Mayer was named as one of Philadelphia Business Journal's, 40 Under 40 winners. 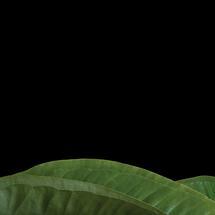 Ivan Stojakovic will participate in "Nature’s Return," a multimedia exhibition curated by Omo Misha. 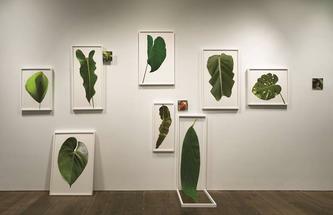 On view March 8 through April 19, Nature’s Return explores the growing dissonance between humanity and the natural world. The Painting Center is pleased to present Shifting Speeds, an exhibition of recent paintings by Arden Bendler Browning, Rebecca Rutstein, and Charles Burwell, highly regarded artists who prompt us to reflect upon the elasticity of time, space, and perception. In varying ways, these artists explore multi-layered approaches to painting, from the use of screen-printing, templates, and overlapping transparencies, to combinations of broad strokes, evolving patterns, or precise detail. 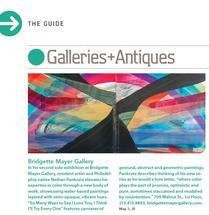 Gallery owner and director, Bridgette Mayer, is featured in the spring issue of Philadelphia Style Magazine. 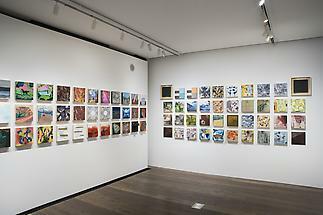 Shelley Spector will be exhibiting at Ester Klein Gallery at Breadboard with her new show "Dreck Groove". 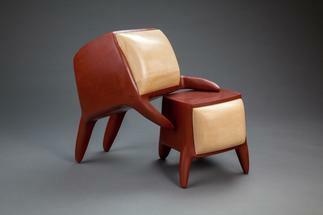 There will also be a workshop with the artist on Saturday, February 25, 12-3pm at NextFab Studio. 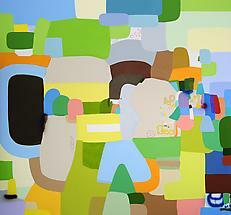 Mark Brosseau's "Bulbous", 2011 is included in the US Department of State's Art Bank Program Recent Acquisitions group exhibition will be on view at the Art Bank Gallery, in Washington DC. 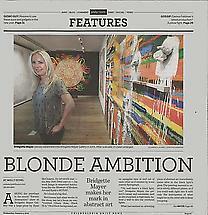 Bridgette Mayer featured in Philadelphia Daily News article, "Blonde Ambition"
Gallery owner and director, Bridgette Mayer, was recently featured in a multi-page spread in the Philadelphia Daily News. Read on to learn about her early life, gallery practice and plans for the future of the art world in Philadelphia. PHILADELPHIA (Oct. 25, 2011) — Bridgette Mayer Gallery is celebrating its 10-year anniversary with a massive transformation — a renovated gallery space on Washington Square and an evolved program. The public will get its first look Nov. 15 when “Karmic Abstraction” opens, highlighting not only the expanded physical space but also an expanding roster of contemporary artists from around the world. 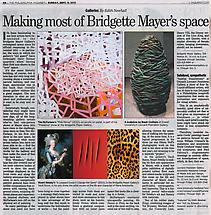 Bridgette Mayer Gallery is pleased to announce its participation for a second year in Art Miami 2011, Miami's premiere anchor art fair. This year, Bridgette Mayer Gallery will exhibit an exciting mix of secondary market works alongside cutting-edge painting, photography and sculpture from the Gallery's contemporary program. Artists include: Neil Anderson, Charles Burwell, Jim Dine, Sam Francis, German Gomez, Eileen Neff, Kenneth Noland, Paul Oberst, David Slovic, Pat Steir, and Steve Tobin. 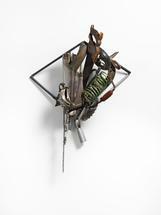 Dana Hargrove will participate in Rollins College's Studio Faculty Biennial Exhibition, featuring the recent work of five artists, on view at the Cornell Fine Arts Museum, October 29, 2011- January 15, 2012. Steve Tobin’s sculptures range in media and content, but what connects them is the sense of wonder that the work evokes. 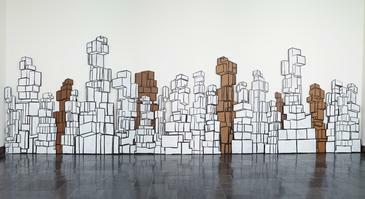 Tobin’s sculptures are often a result of an interaction with nature, presenting a unique view of objects or processes that could easily be overlooked, but which hold the power to drive and shape our world. Bridgette Mayer Gallery is pleased to announce Rebecca Rutstein's solo exhibition "Zero Gravity" at Sylvia White Gallery in Ventura, CA. 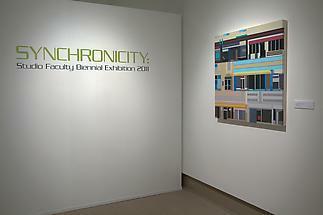 The exhibition will run September 14 - October 15, 2011. In this latest body of work, Rutstein shifts her perspective from the deep ocean to deep space, in an exploration of imagined topographies and physical environments, which convey the undercurrents and forces that continually shape and reshape our world. 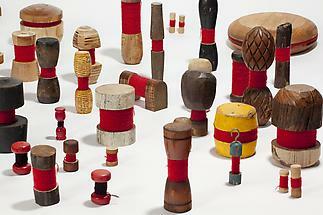 Working in many mediums, artist Paul Oberst creates objects that reference universal themes of ritual and ceremony. 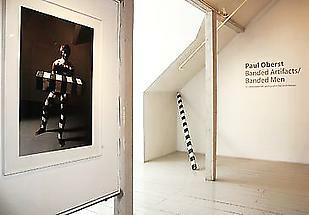 Recently he has been “banding” his created objects and photographic subjects in black and white and colored stripes, inspired by the “trickster” gods of the Southwest Pueblo people. Urbanism provides an opportunity to look at four emerging artists from Philadelphia who, in various ways, re-focus the idea of the urban through a lens that explores the dreams, experience, and potential of the lived environment. Reflecting the overlays of planning that direct our movement within our urban surroundings, Arden Bendler Browning’s imaginations of the city are sprawling paintings where dynamically fractured space suggests the noise and speed of a vivid urban existence. The exhibition Steve Tobin: Master Pieces, curated by Bridgette Mayer, is a collaborative effort by Michael Ryan Architects and Bridgette Mayer Gallery (Philadelphia, PA) that will run June 30 through August 28, 2011, with an opening reception Friday July 1, from 5:30 - 8pm. 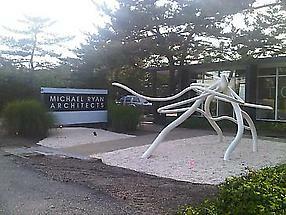 The exhibition will be open Fridays through Sundays at Michael Ryan Architects' Long Beach Island space: 60 Loveladies Harbor, Loveladies, NJ. 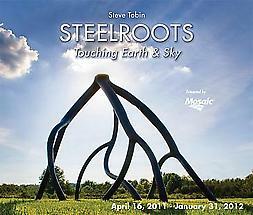 Steve Tobin's sculptures are a dramatic fusion of nature and art. Set among the Arboretum's glowing gardens and peaceful groves, they invite you to touch, stroll through or even lie down beneath them, to discover your own unique views of the land around you, views that change with the light and the seasons. In this show of nine recent paintings, "Structuring Desire/Desiring Structure," Charles Burwell offered no quiet moments. 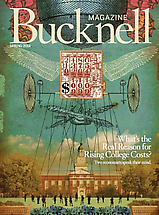 The title suggests a mind comfortable with systems of order, such as those found in math and science. 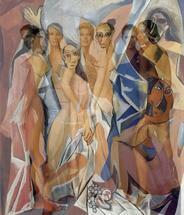 But Burwell's visual world, which comprises overlapping shapes and striated hues, is brilliant and delightful. 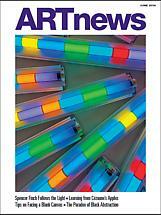 While we think of scientific investigations as somber and labored, Burwell's abstract structures, replete with optical effects, dazzle the eye, prompting viewers to check and recheck what they see. 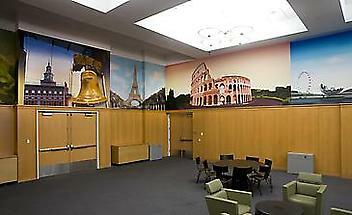 Bridgette Mayer Gallery recently completed a large-scale, commissioned mural project in the Alter Hall MBA Commons at Temple University's Fox School of Business. Dean Moshe Porat wished to fill the empty walls in this large gathering space with depictions of landmarks in cities and regions where the Fox School has a satellite business program or vested cultural interest. 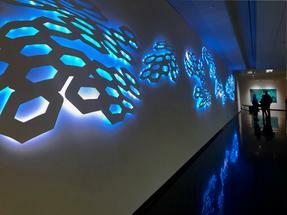 In 2009-2010, Bridgette Mayer Gallery placed over 200 original artworks by 27 artists throughout Alter Hall at Temple University's Fox School of Business. 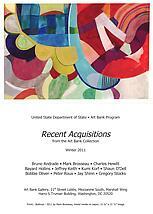 On the occasion of the University's Art Collection Dedication on October 13, 2010, the Gallery produced a fully illustrated catalogue of the artworks in the Collection. 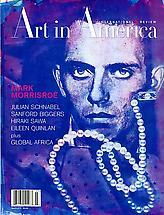 Please contact the gallery for information on purchasing a copy of the catalogue. 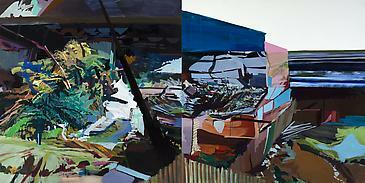 Bridgette Mayer Gallery is pleased to announce that Neil Anderson's work Apollo 3 (2010, Oil on Linen, 48 x 96") has been acquired by the Philadelphia Museum of Art and is now represented in their permanent collection.